My Bond ancestors were from an estate in Cornwall near Plymouth called “Erth Barton”, meaning the farm of the Erth family. The building is today a country manor Bed and Breakfast with the same name. In 1610 a study was commissioned to determine if it was the oldest building in Cornwall, and the conclusion was that it indeed was the oldest building. It came into Bond possession when the only daughter of the Erth (or de Erth) family married Richard Bond. Their descendants were known as the Bonds of “Earth”. The first land grant to a Bond in Pennsylvania was to Richard Bond in 1696 and then one to his wife Sarah Robinet Bond in 1702. Richard is believed to have emigrated to America around 1696. Family history has Richard returning to England for business and dying there before April of 1702. Richard and Sarah had a son Samuel Bond born ca 1692. He married Ann Sharpless in Pennsylvania ca 1726 and soon moved to Cecil County, Maryland. Richard and Sarah had one son, Richard Clayton Bond, born Oct 4, 1728 and three daughters. Samuel left the Church of England to become a Seventh Day Baptist by 1737, and Ann Sharpless left the Quaker Church to become a Seventh Day Baptist with her husband. This approaches the point where our ancestry diverges. 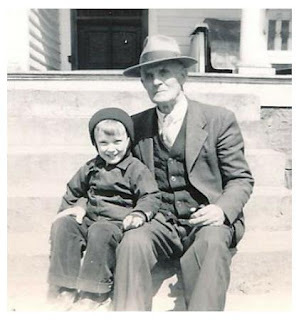 Levi's third son was Richard (1814-1871) and one of his sons was John Corydon Bond (1845-1933), my great grandfather. John Corydon had five sons. Two were twins, one of whom was Charles Austin Bond (1872-1957), my grandfather, who I remember well. My mother was Mary Elizabeth Bond (1911-2009). The Lewis site is extremely well done and has quite a lot more information (including information about siblings that I didn't include). I am grateful for the concise summary of the Bond connection to England. The coat-of-arms hung on my parents' living room wall. 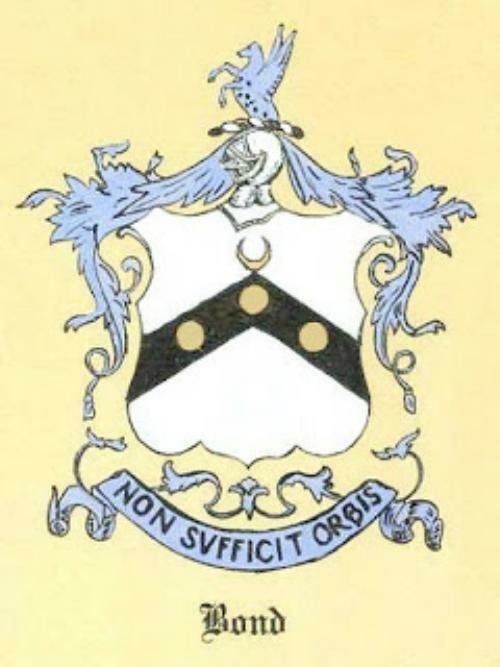 An image search online will discover other Bond coats-of-arms that are very similar.